RPMS places the highest importance on serving the needs of the child. We seek to create an intimate environment in an urban setting that nurtures all who are part of the community - children, parents, and staff. Our classes are a multi-age, three-year grouping, in keeping with the Montessori practice. The mixed age groups provide for peer teaching, role modeling, leadership experiences, and enhance the sense of community within the classroom. RPMS values arts education and provides resources for art, music, drama, and Spanish programming. All our students, from the youngest to oldest, are taught the values fundamental to Montessori education: peace; care of the environment; respecting and celebrating diversity; and engendering a sense of our place in the global community. A highly dedicated and skilled group of teachers and administrators create an educational program of the highest quality. We depend upon committed and involved parents to contribute time, talent, and financial resources. RPMS parents partner with the school to provide children with a nurturing and secure environment that gives them the stability they need to explore the world at large. "Respect all the reasonable forms of activity in which the child engages and try to understand them." Montessori Education is guided by the work and writings of Dr. Maria Montessori (1870-1952), an Italian educator who has influenced educational practices world-wide for over 100 years. The Montessori method is based on educating the whole child from birth to early adulthood. At its core, the philosophy guides us to follow the child, which assumes that every child is a unique individual who is naturally driven to grow, develop, and learn. The development of the whole child encompasses the unfolding of the human spirit and the growth of physical, social, emotional, and cognitive learning. At RPMS we place the highest value on preparing the child to be thoughtful, engaged members of society, as well as academically prepared to face the challenges of our ever changing society. The educational goals include instilling in children a love of learning, the ability to make appropriate learning choices, and respect for oneself, other people, and their physical surroundings. The application of Montessori practices allows the child to explore and be curious, learn at their own pace and to be a contributing member of their classroom community. In a Montessori environment, the individual child is regarded with profound respect and we understand each child learns at his/her own pace and style. Young children experience sensitive periods for learning. These are times when a child is especially receptive to acquiring certain knowledge or skills. Since the classroom environment provides a rich array of learning materials and activities, children are encouraged to choose appropriate work, and to operate independently within the class. As they experience the satisfaction of mastering a task or skill, children are inspired to further challenge themselves. The Montessori classroom is designed to meet the developmental needs and interests of the child. There is no limit to what a child can learn. They are able to advance through the curriculum as they are ready, without being limited by the progress of the group. 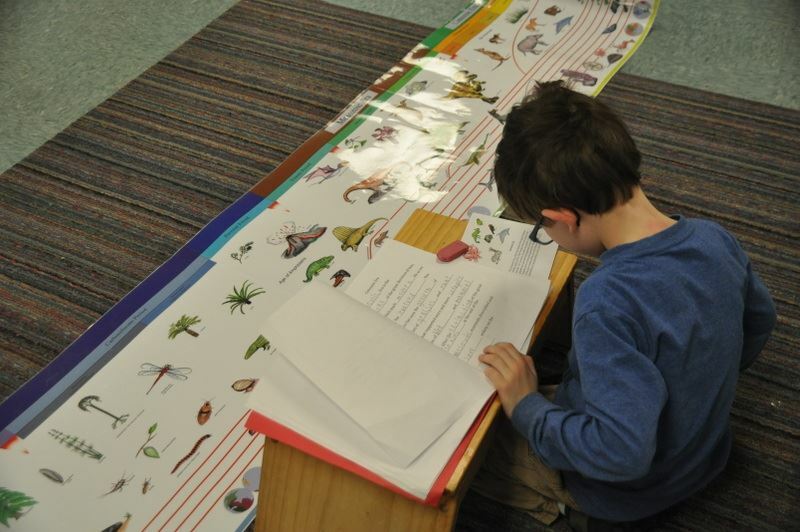 Materials common to all Montessori schools have been researched and developed over decades of classroom use. The individual teacher also brings unique materials she/he has developed. The teacher takes great care in crafting the environment so that materials are arranged sequentially, children have a comfortable work space, and there is freedom of physical movement. "The environment itself will teach the child, if every error he makes is manifest to him, without the intervention of a parent or teacher who should remain a quiet observer of all that happens." The role of the teacher is to act as a facilitator, connecting the child to the materials and activities in the classroom. The teacher prepares the physical environment and provides the necessary guidance and instruction so students can work independently, progress in their work, and thrive socially and emotionally. Lessons are presented individually or in small groups. The teacher monitors progress through observations and frequent interaction. At the elementary level, teachers have regular conferences with children and regularly review their daily/weekly work. The teacher actively ensures the safety of the children through mutually understood ground rules that emphasize respect for the individual and the environment. "A teacher's task is not to talk but to prepare and arrange a series of motives for cultural activity in a special environment made for the child." With acceptance of the commonly shared belief that children are the key to promoting peace, it is the adults' responsibility to help children on this journey. Both parents and teachers play a vital role in providing guidance and role modeling for children in alternative ways of thinking and acting. 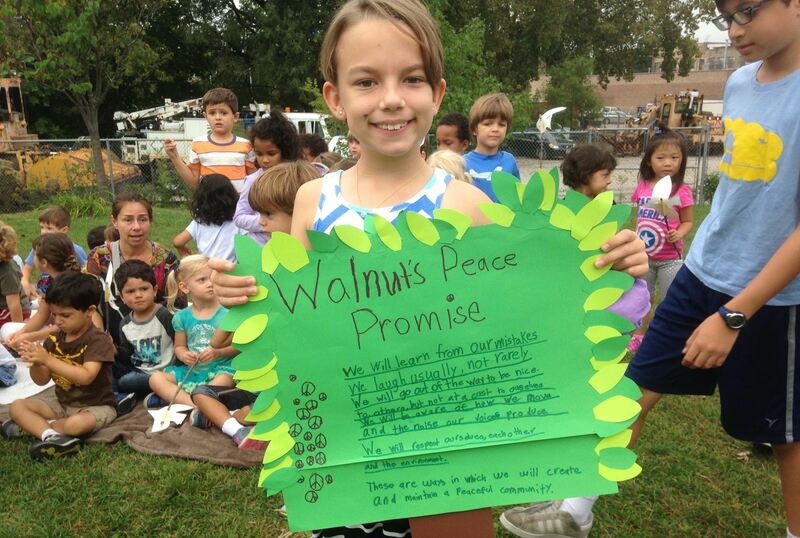 Peace education is a vital and integrated part of school life. We help children develop an awareness of and respect for the dignity and diversity of life in general. It extends to respecting all living things (Cosmic Education), and embracing our individual responsibility to care for the environment in which we live. "The needs of mankind are universal. Our means of meeting them create the richness and diversity of the planet. The Montessori child should come to relish the texture of that diversity. Cosmic education will allow the child to develop a kind of philosophy which teaches him/her the unity of the universe. This is the very thing to organize his/her intelligence and principles and give him/her better insight into their own task and place in the world." Cosmic education is the child's gradual discovery of the inter-relatedness of all things on earth, past, present and future. In keeping with our mission and values, teaching our children respect and an appreciation for cultural diversity is fundamental to our core beliefs. Cultural diversity is embraced and celebrated in the classrooms, reflecting the diverse views of families represented in the parent body and wider community. Children are exposed to a variety of cultural and religious traditions throughout the school year. It is incumbent upon our teachers, parents, and children to respect and support the diverse nature of our community and foster a sense of acceptance.